Suitable for Capacity : 100 kgs/hrto 10,000 kgs/hr. Rotary Air Lock made of SS304 / SS316 and M.S. 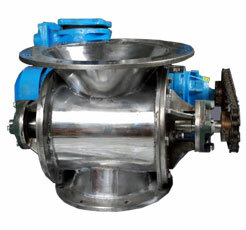 Contact Parts, available in FLP and Non- FLP Designs, suitable to regulate any POWDER Material on constant feeding ( ex; From Silo / Hopper / Storage Tank OR From One Machine to another machine ) Rotary Valve useful in Cement Industry / Powder Chemicals / Food Industry / Polymer Industry / Pesticides / Dyes / Fertilizers Industry / Pharmaceutical Industry. Screw Feeder made for Powder or Non Abrasive material size should be more than 20 mesh. 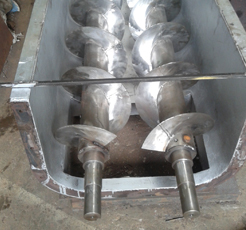 Screw Feeder used where charging point at top and discharge point is at 90 degree, here we are design as per tendency of material. It is useful in Feding material in Rotary Screen, Extruder, Feeding from one vessel to another. Used in Chemical, Pharmaceutical and Food Industry. Rotary Feeder function wise similar to Rotary valve difference is clearance between shell and Vense is 3-4 mm purpose of Rotary Feeder to Feed large quantity material in short time. Mostly it is used in corser material where size of material between 2-4 mm. Process material should not be brittle. Our Std. models are 75mm dia/ 100 mm dia / 150 mm dia./ 200 mm dia and 250 mm dia ( Next Models design as per customer’s requirement. Design of all models are based on Direct Gear Motor with Chain Sprocket drive. Industries we serve : Abrasive Industry, Paper mill Industry, Sugar Mill Industry, Ceramic tiles manufacturer Industry, Metal Industry, Food Powder Industry, Milk powder Industry, Mineral processors Industry, glass industry Industry, Dyes industry, Detergent manufacturer Industry, ash Industry, cashew Industry, Biscuits manufacturer Industry, Resins Industry, Chemical Industry, Guar Gum Industry, Atta Industry, Masala Industry, Explosive Industry, Gelatin manufacturer Industry, Polymer Industry, Pharmaceutical Industry, Bulk Drug Industry etc.